L-carnitine significantly improves cardiac health in patients after a heart attack, say a multicenter team of investigators in a study published on April 12, 2013 in Mayo Clinic Proceedings. The findings, based on analysis of key controlled trials, associate L-carnitine with significant reduction in death from all causes and a highly significant reduction in ventricular arrhythmias and anginal attacks following a heart attack, compared with placebo or control. Heart disease is the leading cause of death in the United States. Although many of the therapies developed in recent decades have markedly improved life expectancy, adverse cardiovascular events such as ventricular arrhythmias and angina attacks still occur frequently after an acute myocardial infarction (heart attack). It is known that during ischemic events L-carnitine levels are depleted. Investigators sought to determine the effects of targeting cardiac metabolic pathways using L-carnitine to improve free fatty acid levels and glucose oxidation in these patients. By performing a systematic review and meta-analysis of the available studies published over several decades, they looked at the role of L-carnitine compared with placebo or control in patients experiencing an acute myocardial infarction. L-carnitine is a trimethylamine which occurs in high amounts in red meat and is found in certain other foods, and is also widely available as an over-the-counter nutritional supplement which is claimed to improve energy, weight loss, and athletic performance. Its potential role in treating heart disease was first reported in the late 1970s. A comprehensive literature search yielded 153 studies; 13, published from 1989-2007 were deemed eligible. Newcastle University scientists have revealed the mechanism that causes a slime to form, making bacteria hard to shift and resistant to antibiotics. When under threat, some bacteria can shield themselves in a slimy protective layer, known as a biofilm. It is made up of communities of bacteria held together to protect themselves from attack. Biofilms cause dental plaque and sinusitis; in healthcare, biofilms can lead to life threatening and difficult-to-treat infections, particularly on medical implants such as catheters, heart valves, artificial hips, and even breast implants. They also they coat the outside of ships and boats polluting the water. The article was published in the April 12, 2013 issue of the Journal of Biological Chemistry, and was cited as the “paper of the week.” In the article, the research team reveals how a molecular switch regulates biofilm formation. This new understanding could help identify a new target for antibiotics and prevent other biofilms from forming. In order to thwart them from causing disease and biopollution, a Newcastle University team has been studying at the molecular level how bacteria form biofilms in the first instance. They reveal how the master regulator of biofilm formation, a protein called SinR, acts in the model bacterium, Bacillus subtilis. Dr. Richard Lewis, Professor of Structural Biology in the Institute for Cell and Molecular Biosciences who led the research, said, “SinR is a bit like a rocker switch, a domestic light switch for instance. In the "down" position, when SinR is bound to DNA, the proteins required to make a biofilm are turned off and the bacteria are free to move. Researchers at the Mayo Clinic in Florida participated in a nationwide study that found minor differences between genes that contribute to late-onset Alzheimer's disease in African-Americans and in Caucasians. The study, published in an open-access article in the April 10 issue The Journal of the American Medical Association (JAMA), was the first to look at the genetics of a large number of African-Americans diagnosed with this common form of Alzheimer's disease (1,968 patients) compared to 3,928 normal elderly African-American control participants. The Alzheimer's Disease Genetics Consortium conducted the study, which included Mayo Clinic in Florida investigators Neill R. Graff-Radford, M.D., and Nilufer Ertekin-Taner, M.D., Ph.D. They provided genetic samples and data from their Alzheimer's disease databank. The study found that the most common risk factor in these African-American patients was the APOE gene, which is also true for Caucasians with the disorder. In addition, another gene, ABCA7, which was discovered to be a risk locus for Caucasians, was also a significant risk factor in African-American patients. The study concluded that association with variants at the ABCA7 gene increased the risk for late-onset Alzheimer's disease approximately 1.8-fold in these African-American patients compared to 1.1-fold to 1.2-fold in individuals of European ancestry, although the biologic implications of this difference remains to be established. Still, these differences may not fully explain the genetic basis for development of Alzheimer's disease, the researchers say. The disorder is believed to arise from a number of different genes along with environmental influences. 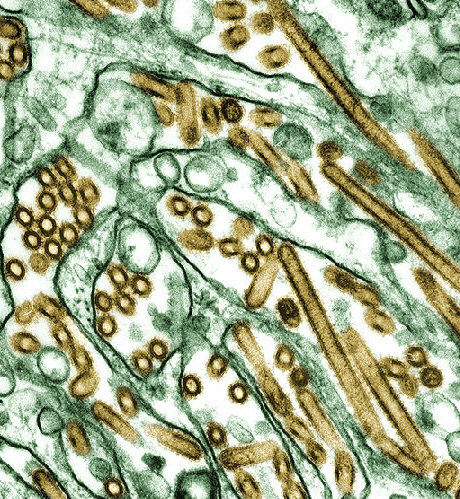 A genetic analysis of the avian flu virus responsible for at least nine human deaths in China portrays a virus evolving to adapt to human cells, raising concern about its potential to spark a new global flu pandemic. The collaborative study, conducted by a group led by Dr. Masato Tashiro of the Influenza Virus Research Center, National Institute of Infectious Diseases, and Dr. Yoshihiro Kawaoka of the University of Wisconsin-Madison and the University of Tokyo, appears in the April 11, 2013 issue of the journal Eurosurveillance. The group examined the genetic sequences of H7N9 isolates from four of the pathogen's human victims, as well as samples derived from birds and the environs of a Shanghai market. "The human isolates, but not the avian and environmental ones, have a protein mutation that allows for efficient growth in human cells and that also allows them to grow at a temperature that corresponds to the upper respiratory tract of humans, which is lower than you find in birds," says Dr. Kawaoka, a leading expert on avian influenza. The findings, drawn from genetic sequences deposited by Chinese researchers into an international database, provide some of the first molecular clues about a worrisome new strain of bird flu, the first human cases of which were reported on March 31, 2013, by the Chinese Center for Disease Control and Prevention. So far, the new virus has sickened at least 33 people, killing nine. Although it is too early to predict its potential to cause a pandemic, signs that the virus is adapting to mammalian and, in particular, human hosts are unmistakable, says Dr. Kawaoka. Access to the genetic information in the viruses, he adds, is necessary for understanding how the virus is evolving and for developing a candidate vaccine to prevent infection. Stem cells are different from all other cells in our body because they retain the remarkable genetic plasticity to self-renew indefinitely, as well as develop into cell types with more specialized functions. However, this remarkable self-renewal capacity comes with a price, as stem cells can become seeds of cancer. Identifying genetic programs that maintain self-renewing capabilities therefore is a vital step in understanding the errors that derail a normal stem cell, sending it on a path to become a cancer stem cell. Isolating cells from various other cell types is very much like fishing -- you need a good "hook" that can recognize a specific protein marker on the surface of a cell, in order to pull that cell out. Until now, isolating pure mammary gland stem cells (MaSCs), which are important in mammary gland development, as well as breast cancer formation, has posed a challenge. MaSCs are scarce and share common cell-surface markers with other cells. In a paper published online on April 11, 2013 in PNAS, scientists in the laboratory of Professor Gregory Hannon at Cold Spring Harbor Laboratory (CSHL) in New York used a mouse model to identify a novel cell surface marker on MaSCs. Using that marker, the team was able to assemble a sample of MaSCs of unprecedented purity. "We are describing a marker called Cd1d (see image)," says CSHL research investigator Camila Dos Santos, Ph.D., the paper's first author. The marker, also present at the surface of specialized immune cells, is expressed on the surface of a defined population of mammary cells in both mice and humans. The team took advantage of the fact that MaSCs divide much mpre slowly than other cells. In an April 8, 2013 press release, Elsevier, a world-leading provider of scientific, technical, and medical information products and services, announced a significant content expansion and an improved and enriched user interface for Reaxys, a unique chemistry workflow solution. With this interface and content update, Reaxys now supports the entire chemistry workflow resulting in a faster and more efficient research process. Reaxys now encompasses over 16,000 periodicals and has coverage of over 30 million reactions and over 500 million experimentally measured data. Designed by chemists for chemists, Reaxys enables researchers to advance quickly and confidently through their workflow in order to deliver superior outcomes. An independent survey of 200 users of the product found that the research process was conducted on average 30 percent more quickly with Reaxys, when compared to existing alternatives; and related R&D costs were estimated to be reduced by almost 25 percent. “The pressure on chemists to deliver results is considerable whether they’re working in the public or private sector. Like in many other fields, the quantity of data is increasing exponentially. Researchers do not have time to read everything, so they need a solution that helps them to quickly find the right information sources. 95 percent of the top global spenders in pharma use Reaxys because it is flexible enough to accommodate, for example, all the content that researchers need, displayed in one common user interface, ensuring that they don’t have to switch from one system to another,” said Dr. Jürgen Swienty-Busch, Director of Product Management for Reaxys. “The two most critical things for our customers are innovation and efficiency.